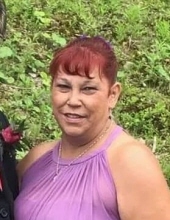 Nicole M. Kopczynski, 47 of Perry passed away on Friday April 12, 2019 at her home. Nicole was born in Schenectady, New York on March 9, 1972 a daughter to the late John Raymond Keenan and Luella (Baker) DeVarnne of Schenectady, NY. Nicole was a homemaker who loved taking care of family and friends, the joy of her life was her two grandchildren. She enjoyed doing crafts, playing Pokemon-Go on her phone or just enjoyed spending time with her family. She was a co-leader for Girl Scouts in Perry. She was loved by every person she touched, and loved them just the same. She is survived by her husband: George P. Kopczynski whom she married on December 22, 1989, 2 children: Amber (Chris) Bryant and Corellon “CJ” Kopczynski both of Perry, her mother: Luella DeVarnne of Schenectady, a sister: Sara DeVarnne of Gloversville, 3 brothers: Shane, Eric and John Keenan of Schenectady, several step siblings, two grandchildren: Seth Kopczynski and Lilly Bryant, a sister-in-law: Martha (William George of Castile, along with many nieces, nephews and friends. Along with her father she is preceded in death by her step father who raised her John Raymond DeVarnne. Family and friends may call from 4-6pm on Tuesday April 16th at the Eaton-Watson Funeral Home, LLC. 98 North Main St. in Perry where services will follow at 6pm. To send flowers or a remembrance gift to the family of Nicole M. Kopczynski, please visit our Tribute Store. "Email Address" would like to share the life celebration of Nicole M. Kopczynski. Click on the "link" to go to share a favorite memory or leave a condolence message for the family.